An industrial dining area to be envious of, this living/dining room combines contemporary style with vintage furniture perfectly. Both the reclaimed tractor seat stools and the school chairs are from our vintage seating range. 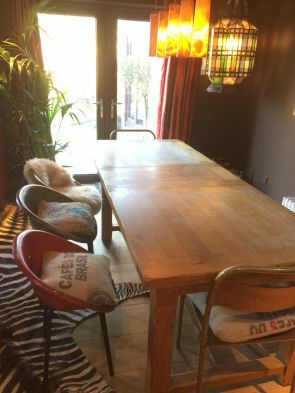 The quirky seating choice complements the simplicity of the wooden dining table, and allows what could have been a generic dining space to be transformed into somewhere that really stands out. Feature lighting combined with plenty of natural light works well with the dark walls, creating a homely, warm feel while also enhancing the industrial style of the space. 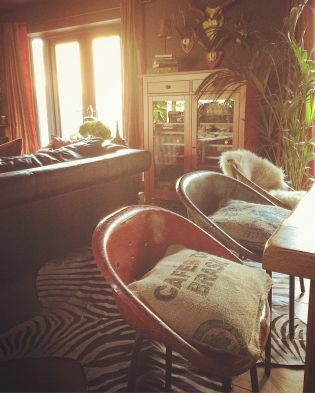 To complete the room, an eclectic mix of accessories have been dotted around, including some homemade hessian sack cushions. These small details really pull the room together and give it plenty of character. 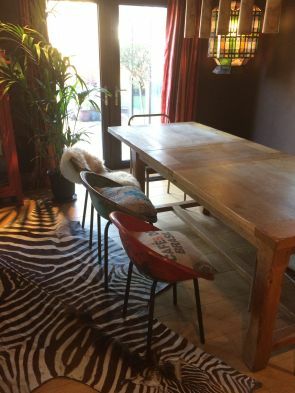 We have lots of quirky vintage pieces in stock, shop now to create a similar look in your home! We would love to see our furniture in your home or business! 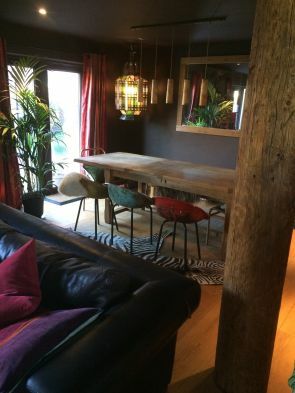 Send your photographs to aimee@peppermillinteriors.com so we can feature them in our blog. 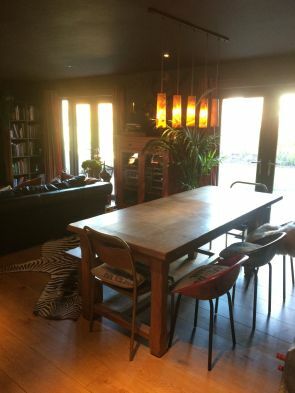 * See below for more great photographs of this dining space. These photographs were kindly sent to us by Sarah, see more from her fabulous home on Instagram (@myoffthewallinterior).